The staff were unfailingly friendly and helpful. This is a good 'safe' first Bali experience within a sprawling compound. This family-friendly Ubud hotel is within 3 mi (5 km) of Gaya Art Space, Neka Art Museum, and Blanco Museum. Gunung Lebah Temple is 3 mi (4.9 km) away. Get ready to say 'Bye, Felicia' to everyday life and hello to Ubud. If you're itching to get away, lastminute.com.au can help you lock in a ridiculously good-looking deal on your accommodation (Felicias not included). With an impressive 220 hotels within 2 kilometres of the CBD, the biggest problem you'll have will be picking the right one. 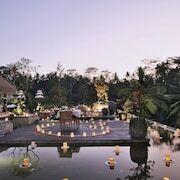 To chillax in among the action, try the Viceroy Bali or The Purist Villas & Spa. 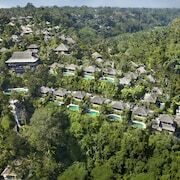 You should also try out the COMO Uma Ubud and the Maya Ubud Resort and Spa. 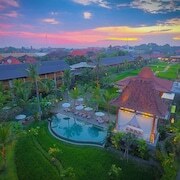 Ubud City-Centre, located just 0.2 kilometres away from the centre of town, is a prominent suburb with 99 accommodation options. 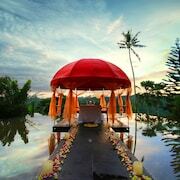 Check out the rates at the Royal Kamuela Villas - Monkey Forest Ubud and KajaNe Mua. Ubud Monkey Forest really should be right up the top of your must-sees. If you'd like to stay close to this leading sight, book in at the Four Seasons Resort Bali at Sayan or The Chedi Club Tanah Gajah, Ubud. Be surrounded by a long gone world at Museum Purbakala. The Villa Puri Darma Agung and Kamandalu Ubud should be well up on your hotel hit list if you're looking to stay nearby. Spend an afternoon at Wisata Burung Kokokan. You'll relax knowing that the creatures there are healthy and cared for. If you'd rather kick up your feet near this attraction, take a look at the Bidadari Private Villas & Retreat and Chapung SeBali Resort and Spa. Saving cash on accommodation means there's more to spend on fun things. Suss out the seriously good rates at some of the area's budget hotels. Some of the most popular options are Sadru House and Karang Mesari Ubud Guest House. Shriman Yoga Bungalows and Friendly House Bali - Hostel are some alternative lower-cost options well worth looking into. You might also like to check out the rooms at The Legian, Bali or the Bale Gede Villas. 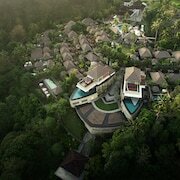 The Legian, Bali is 25 kilometres away from central Ubud, and the Bale Gede Villas is 20 kilometres away. Further alternatives are the Soori Bali, 25 kilometres away, and the Peppers Seminyak, 20 kilometres away. Still haven't discovered your perfect room? You might just find the thread count you've been looking for in Tampaksiring. You'll also be able to have some adventures at Sasana Budaya Giri Kusuma and Bukit Demulih. Some of our recommended Tampaksiring hotels are the Elephant Safari Park Lodge and Puri Sunia Resort. 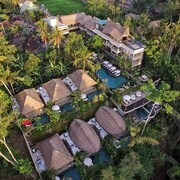 Or, you could consider staying in Payangan, 11 kilometres to the north of Ubud, where you can pick from the Bagus Jati Health & Well Being Retreat and Jiwa Klusa Luxury Villa. While in Payangan, don't miss the Tirta Empul Temple and Istana Kepresidenan Tampaksiring. Arrived at Ngurah Rai International Airport? Feeling a bit icky after the flight? Not a problem. Shampoo and towels are up for grabs nearby at The Sandi Phala. If you can't snap up a room there, try your luck at the Discovery Kartika Plaza Hotel. It's also nice and close to the airport, which sits 30 kilometres from the centre of town.